Get a SFIAF Festival Pass! 'Indo Latin Jazz Live In Concert' by Mariah Parker on JazzWeek/ZMR Charts! 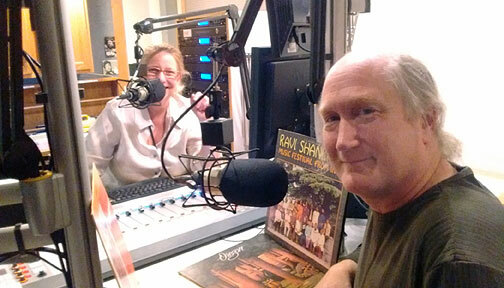 On Friday, May 26, at 9 AM, Matthew Montfort was Alisa Clancy's Guest Castaway on Desert Island Jazz on KCSM Jazz 91.1 FM, playing his music right along side the music that influenced it. 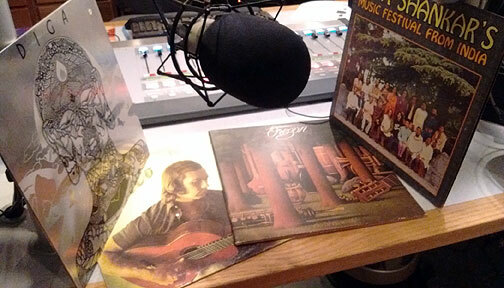 He even brought out the original vinyl copies of the recordings that he listened to over and over in his youth! This is a rare chance to hear timeless music from the past along with unreleased music from Ancient Future's Archive of Future Ancient Recordings. Also discussed are three concerts at the San Francisco International Arts Festival: Ancient Future on 6/1, Mariah Parker's Indo Latin Chamber Jazz on 6/3, and the Global Guitar Summit on 6/4. The radio show will be archived through June 8, 2017, at radiofreeamerica.com, so stream it now! Book: Classical Music of North India, the First Years of Study: The Music of the Baba Allauddin Gharana as Taught by Ali Akbar Khan at the Ali Akbar College of Music, George Ruckert, Ed. Ancient-Future.Com Records artists will perform three different concerts as part of the San Francisco International Arts Festival at Fort Mason. A festival pass let's you see five different SFIAF shows for only $70! 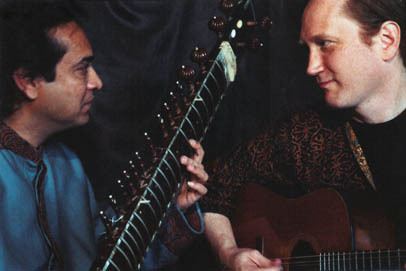 Thursday, June 1, 2017, 8 PM, Ancient Future Guitar-Sitar Jugalbandi with Matthew Montfort (scalloped fretboard guitar), Pandit Habib Khan (sitar), and Ferhan Najeeb Qureshi (tabla), San Francisco International Arts Festival, Fort Mason Chapel, Upper Fort Mason, San Francisco, CA 94109. Take Franklin Street from Bay Street. The Chapel is located near Park Head Quarters and the General's Residence. Admission: $25 general, $12.50 under 18. Full time students with ID and seniors, $4 off cover price. 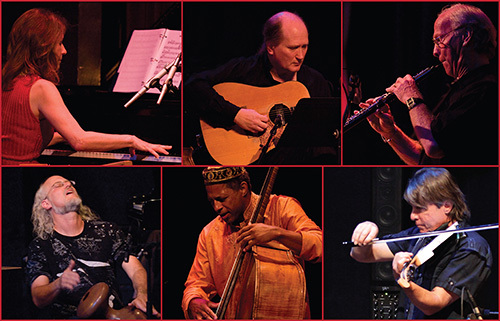 Festival Pass, 5 shows for $70 (also see Global Guitar Summit 6/4, Indo Latin Jazz 6/3, and 2 more!). Buy Tix. Concert Poster. Press Release. Jugalbandi is a classical North Indian musical duet (meaning literally "tied together"). This jugalbandi works well because Matthew Montfort is a pioneer of the scalloped fretboard guitar with knowledge of sitar, and Pandit Habib Khan has been described as the “Jimi Hendrix of the sitar” by L'Orient le Jour, Beirut's French language newspaper. They will be accompanied by tabla master Ferhan Qureshi. Saturday, June 3, 2017, 6 PM, Mariah Parker's Indo Latin Chamber Jazz with Mariah Parker (piano, santur), Matthew Montfort (scalloped fretboard guitar), Ian Dogole (percussion), Kash Killion (upright bass), and Jim Hurley (violin), San Francisco International Arts Festival, Gallery 308, Fort Mason, San Francisco, CA 94109. Admission: $25 general, $12.50 under 18. Full time students with ID and seniors, $4 off cover price. Festival Pass, 5 shows for $70 (also see Ancient Future 6/1, Global Guitar Summit 6/4, and 2 more!). Buy Tix. Concert Poster. Press Release. According to Latin Beat Magazine, "Parker and friends blend the rhythmic syncopations of Latin jazz music with the entrancing, asymmetrical meters of East Indian rhythms resulting in first-class world music." This chamber variation of the ensemble with its emphasis on strings will explore new arrangements of existing work. Sunday, June 4, 2017, 3 PM, Global Guitar Summit with Matthew Montfort (scalloped fretboard guitar), Giacomo Fiore (classical guitar), and Teja Gerken (acoustic guitar), San Francisco International Arts Festival, Fort Mason Chapel, Upper Fort Mason, San Francisco, CA 94109. Take Franklin Street from Bay Street. The Chapel is located near Park Head Quarters and the General's Residence. Admission: $25 general, $12.50 under 18. Full time students with ID and seniors, $4 off cover price. Festival Pass, 5 shows for $70 (also see Ancient Future 6/1, Indo Latin Jazz 6/3, and 2 more!). Buy Tix. Concert Poster. Press Release. This Global Guitar Summit features American scalloped fretboard guitar and world fusion music pioneer Matthew Montfort, master Italian guitarist and musicologist Giacomo Fiore, and German fingerstyle guitarist extraordinaire Teja Gerken. Indo Latin Jazz Live In Concert by Mariah Parker (Ancient-Future.Com AF-20142). Indo Latin Jazz Live in Concert captures the magic of the concert debut of Mariah Parker's Indo Latin Jazz Ensemble in front of a full house at Yoshi’s in Oakland, as well as subsequent concerts at Berkeley’s Freight & Salvage, the Throckmorton Theater in Mill Valley, and Bob Weir’s TRI Studios in San Rafael. The recording includes Ancient Future musicians along with top Indian musicians and jazz and Latin players who have performed with Sun Ra, Herbie Hancock's Headhunters, and Oregon. For example, jazz wind virtuoso Paul McCandless is known for his groundbreaking work with the seminal chamber jazz group, Oregon. Indo Latin Jazz Live in Concert spent six weeks on the very prestigious JazzWeek National Airplay Chart where it reached #32, and just debuted at #22 on the ZMR World Chart! Much is being lost in this age of connected cars and smart phones. The convenience of the quick click to free lo-fi streaming has made music simply a taken-for-granted background soundtrack to life. Yet the real power in music comes from absorbing it into one's being and letting it resonate there to do its magic. One must become the music, and that isn't possible while scrolling through a twitter feed. The digital distraction of constant connection is keeping people from experiencing the moment they are in. Indeed, it is common to see people at live concerts buried in their phones ignoring the music pouring from the master musicians on stage. Clearly it is time to bring back quality to your music listening experience. Instead of streaming background playlists for daily activities, devote time to become the music you love. Just listen and absorb the glorious sound into your being. In this way, music can be an antidote to the negative effects of digital distraction. To accomplish this, buy hi-fi music and play it on a nice stereo. It is best to set up a home listening station. This can be accomplished in a variety of ways, but the old fashioned home stereo with a CD player and even a turntable is a fantastic option, and you can get one used cheap these days. Or, you can get a hi-resolution audio interface for your computer and buy a pair of powered monitors. Just make sure to play at least CD quality audio files. There is a big difference between CD quality and the standard compressed audio formats of the major download sites. You will hear and feel the difference when you are truly absorbing the music, and this difference is more pronounced on music with a lot of detail. Streaming music is even lower quality, and the major streaming sites don't even come close to making a sustainable financial contribution to an artist's ability to make new recordings, as payments are now measured in thousandth of a cent increments. Mariah Parker's new CD is having an amazing run on the radio airplay charts. Indo Latin Jazz Live In Concert is available at all of the major download and streaming sites. But a hi-resolution copy is needed to hear the record in its full glory. Yet, in a sign of the times, despite the great success of the record on radio, no one has purchased a CD copy at the Ancient Future website! Indeed, there have only been two CDs sold at Ancient-Future.Com this year. Before downloads and streaming, monthly sales ranged between $200 and $1000. Of course, this has a detrimental effect on the artist's ability to bring you new music. You can be the very first to buy her CD at Ancient-Future.Com to hear it in its full glory. While you are at Ancient-Future.Com, take advantage of sale prices on a variety of CDs. There are even still a few very rare original copies of Ancient Future's first LP, Visions of a Peaceful Planet, available on vinyl for a truly analog listening experience! In other news, work is being done right now to make it possible to download 24-bit hi-resolution audio at Ancient-Future.Com. Stay tuned! Learning about music is another way to absorb more of its magic into your life. 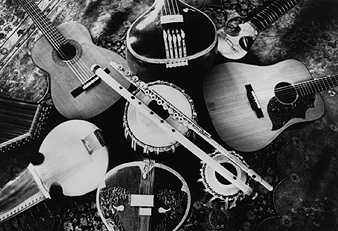 Those who understand the structures of various musical traditions get more out of listening to them. 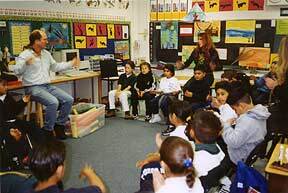 The World Music Education section of Ancient-Future.Com provides a good introduction to that magic. Matthew Montfort's book, Ancient Traditions – Future Possibilities: Rhythmic Training Through the Traditions of Africa, Bali and India, can provide the next step on your path to getting more out of music. The book takes the student on a musical voyage through these great ancient rhythmic traditions with a series of exercises that require no instruments to perform. Through hand clapping, foot tapping, and vocal recitation, the traditions move right into your body. While the book does use standard music notation to convey the exercises, for those who can't read music counting is provided and the book is typeset so that page space equals time, which provides an excellent visual cue to the rhythms. The exercises are available as a complete 2 CD set of 115 audio guide tracks to supplement the book for those who don't read music. For those comfortable with music production file formats, the exercises are also available as Ancient Rhythms – Future Grooves, a set of 128 MIDI percussion groove tracks for loading into a music sequencer or web browser. Work is being done to expand the educational offerings at Ancient-Future.Com through educational downloads, and Ancient Rhythms – Future Grooves is the very first to be offered! Matthew Montfort offers private lessons on the traditions on the Ancient-Future.Com world music education web site via Skype. Instruction is tailored to the individual needs of the student, so don't be shy if you are just looking for explanations that will help you enjoy the music more. Music lessons make an excellent gift, and introductory sale rates on individual Skype lessons are being offered for a limited time.